Solar energy will very likely be the main source of power as the world continues to strive toward greater sustainability. But it won’t be just the large panels that get the job done. In fact, I’m willing to bet that ultra thin and flexible solar cells that can be attached to virtually any surface will be the future. Which is why breakthroughs in this area are so important. And now a team of South Korea scientists has successfully created a super thin solar cell, which is so flexible it can be wrapped around a pencil without causing damage or too much strain to it. The solar PV cell that they created is one micrometer thick (which is even thinner than a human hair) and it is this thinness that gives it the extreme flexibility it boasts of. 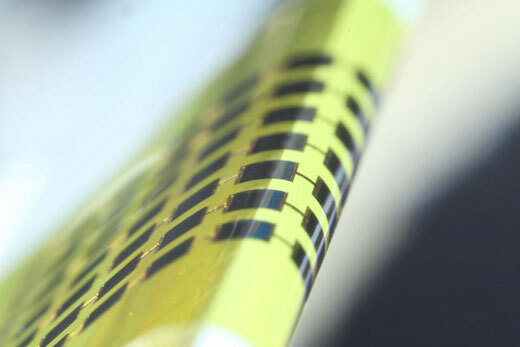 It is made from a semiconductor gallium arsenide, which is stamped onto a flexible metal substrate. No adhesive is used in this process, instead it is fused with the electrode on the substrate with a cold welding process that involves applying pressure at 170 degrees Celsius. And the metal layer also acts as a reflector that directs light back onto the cell. Testing the limits of the cell’s flexibility they found that it can be bent around an object with a radius of 1.4 millimeters. Despite their thinness, the solar cells have an energy conversion efficiency comparable to thicker ones. They also exhibited only one quarter of the strain from the bending compared to a 3.5 micrometers thick cell. The real-world application of this type of cell would be far-ranging. It could be used on smartphones, fabric, and smart glasses, while it could also easily be integrated into self-powered devices, such as, for example, environmental sensors located in hard to reach places. There is no definitive word yet on when and if they plan to bring this cell to market. Alphabet, the parent company of Google, has a so-called X division, which works on highly experimental projects. But a lot of these projects could prove very beneficial in solving some of the world’s biggest problems. This division created Google’s self-driving car, as well as Project Loon, which involves high altitude balloons carrying Wi-Fi. And now it is looking for more efficient and effective ways of high-density energy storage. 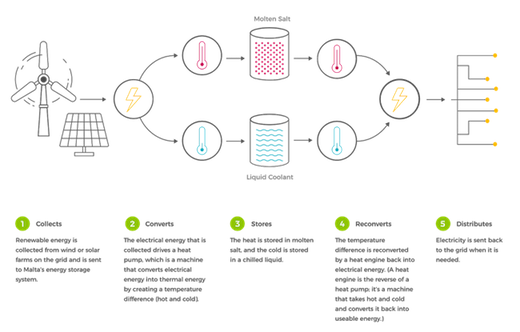 This project is called Malta and the energy storage solution they came up with features molten salt storage, which X has paired with cold storage using antifreeze. Molten salt energy storage has been looked at before as a viable solution for energy storage, and paired with antifreeze, it can store energy for days, possibly weeks. As such, it would be perfect for storing renewable energy, which is simply getting discarded in lots of places at the moment. Reports show that China discards 17 percent of energy produced by wind per year, while Germany tosses away 4 percent. And this year alone, California has had to discard 300,000 megawatt hours of excess electricity from the grid, all of which came from renewable sources. If there was a way to store that energy, it would be enough to power thousands of homes. The dual thermal energy storage tech that X has come up with can be used to store high densities of energy, while it will also be a lot less expensive than existing solutions. It is also very scalable, since all it would take to expand it would be adding more salt and cold liquid tanks to the system. Also, the salt used can be charged and re-charged several times over its lifespan. They’ve already built a small prototype of this energy storage system in Silicon Valley. They’re now looking for partners, such as Siemens and GE, to develop a commercial prototype, which can be tested on the grid. 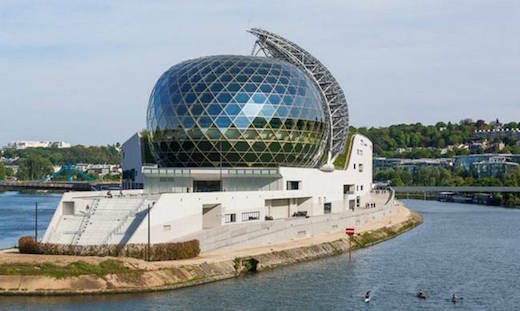 Ban created the Seine Musicale theatre building in collaboration with French architect Jean de Gastines. It is located in the western suburbs of Paris, on the Île Seguin. The round building can seat 5,500 and contains two separate main halls, five recording studios, several practice rooms, as well as a huge rooftop garden that is planted with more than a dozen different tree species. However, the really impressive part of the building is the 200-ton and 147-foot (45-meter) movable “sail” covered in solar panels. It is a heliotropic surface, which is capable of automatically tracking the path of the sun at a rate of 16 feet (5 meters) per minute. 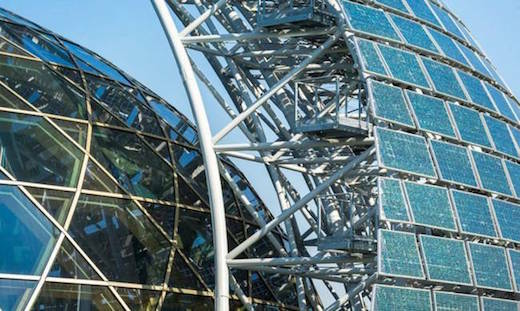 In this way the solar power generation of the array is maximized, while the “sail” also provides shading for the interior. 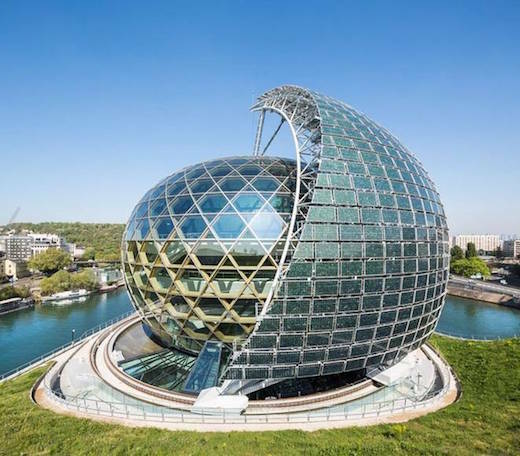 It is definitely a feat in sustainable design, and Ban hopes in time the building will become one of the world famous symbols of Paris, alongside the Eiffel Tower and the Louvre pyramid. The theater has a timber structure, which is robust enough to support its glass skin. 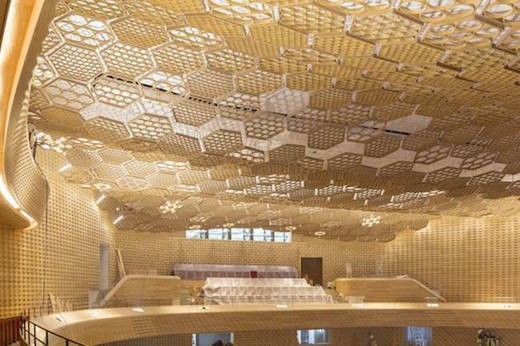 The ceiling of the 1,150-seat classical music auditorium is made out of hexagonal elements that satisfy the acoustic demands of building such a structure. 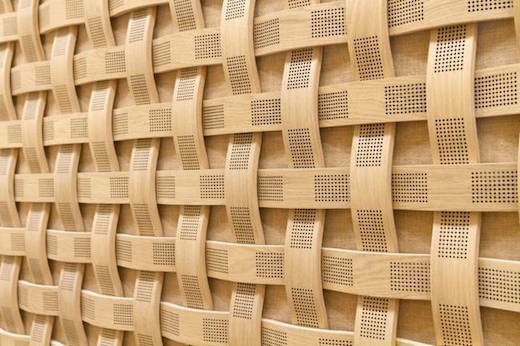 It is covered with an array of tubes that are made from wood, cardboard and paper, while weaved wooden slats cover the walls. This project took four years to complete, and it is a great example of how cutting edge technology can be used to make our buildings more sustainable. Hopefully more future projects will incorporate such innovative solutions. The cabin is very small and cave-like. 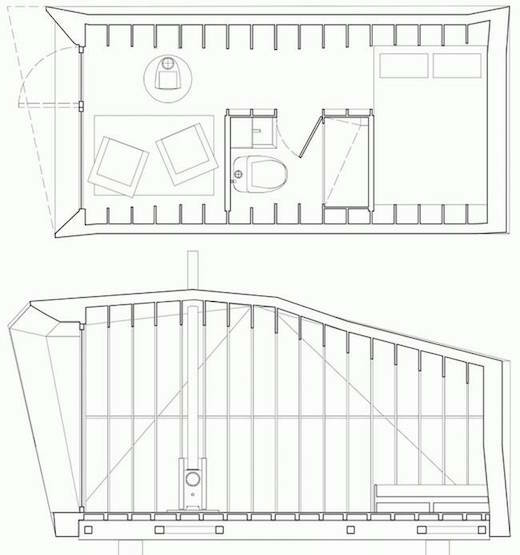 It features a small living area, a bathroom and a den-like bedroom in the back. 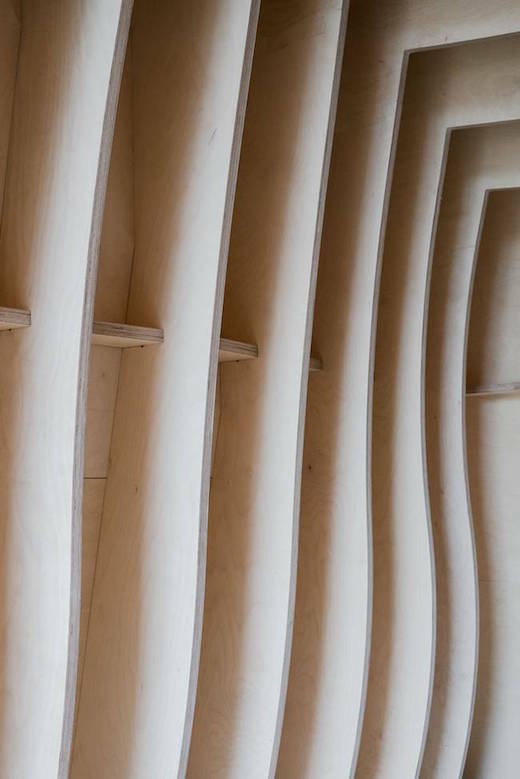 It has an undulating rib structure and sheathing made of CNC-cut birch plywood. Each section of the ribs is made up of many smaller pieces, which are joined together by jigsaw joints. A small woodstove is also installed in the cabin and takes care of the heating needs. The cabin also has hot and cold running water, and LED lighting throughout. Power comes via an array of solar panels while it is also equipped with a composting toilet. In other words, it functions off-the-grid. 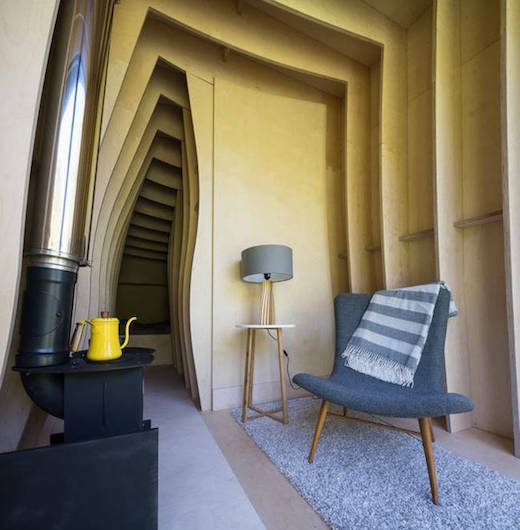 The cabin is located in Castell y Bere and the materials used to build it were sourced locally. 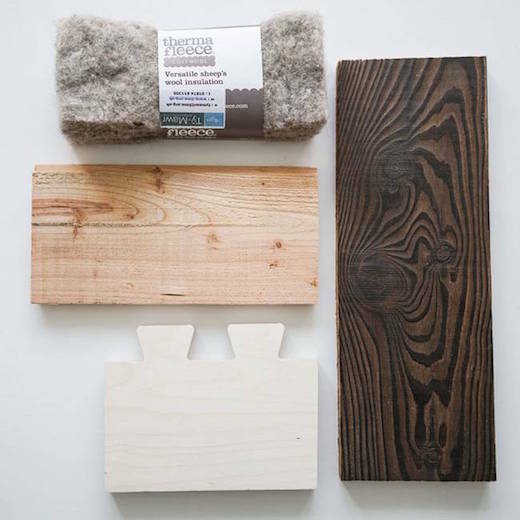 They include dark-stained larch boards from the nearby Esgair Forest, which were milled in Machynlleth . They also used sheep’s wool for insulation and they obtained this material from the town of Ty-Mwar. 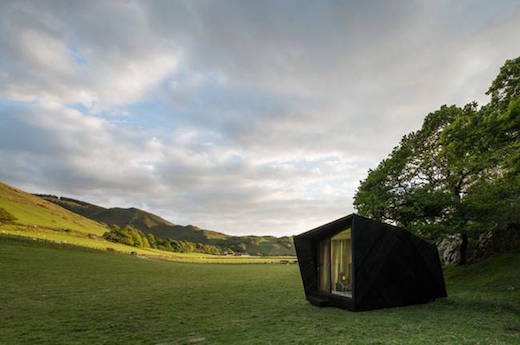 This first Arthur’s Cave will soon be a part of a popup hostel, along with eight other cabins like it. The hostel is set to open later this summer, and will offer a comfortable, sustainable and unique glamping experience. There is no word on what the prices to rent one of these cabins will be.